Time for the Halloween home tour! I try and keep things “cute” with the Halloween decor instead of traditional spooky. My little ones can only handle so much scary still. Somehow bats on the wall are ok. 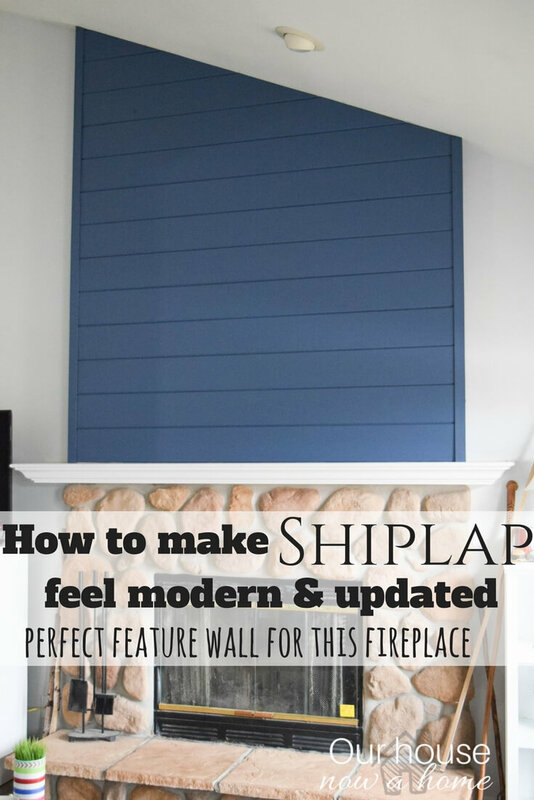 I focused mainly on my fireplace mantel, and stuffed it with DIY projects and crafts! 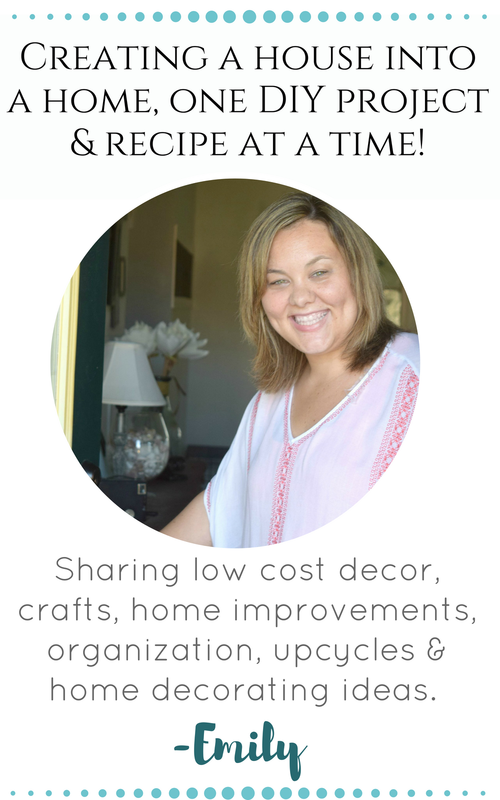 The best way to decorate for a holiday or season and keep the cost low. This time of year I feel like my house is in constant transition. I had my fall decor out. I put a lot of it away for Caleb’s birthday party this weekend. Then I whipped up all of my best spooky decor for Halloween. 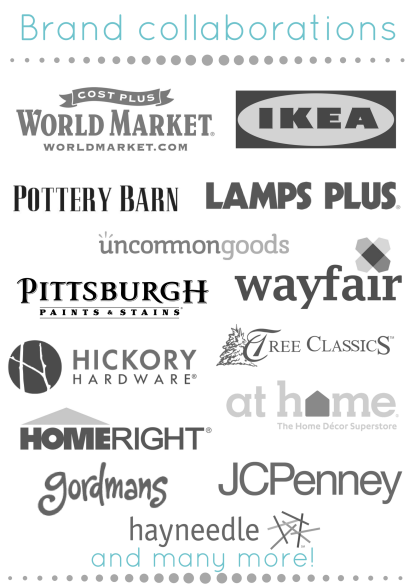 We will enjoy this for about two weeks, then it is back to fall and then the massive decor overhaul that is Christmas! I really do love decorating for this time of year with all of the changing of the seasons, and adore each seasons for different reasons. But, I do wish that they were spread out a little more. So I could enjoy them. This is how the calendar year goes, so there is no choice but to go with the flow. Or decorate for Christmas in July, which is not going to happen either. With Halloween I really do only a few different things to my home. I layer on the spooky specific things to the already set out fall decor. I was going to dust, but figured the light dust and black book shelf works wonders for the spook factor. Lazy house cleaning has a purpose now! I did a few DIY projects for this Halloween season. Most of which have been shared already. 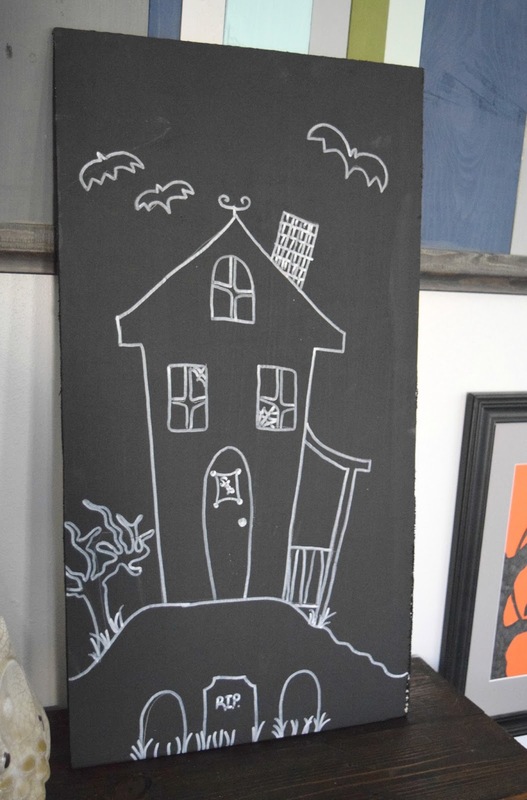 I shared these Halloween chalkboard signs, that can be found here. 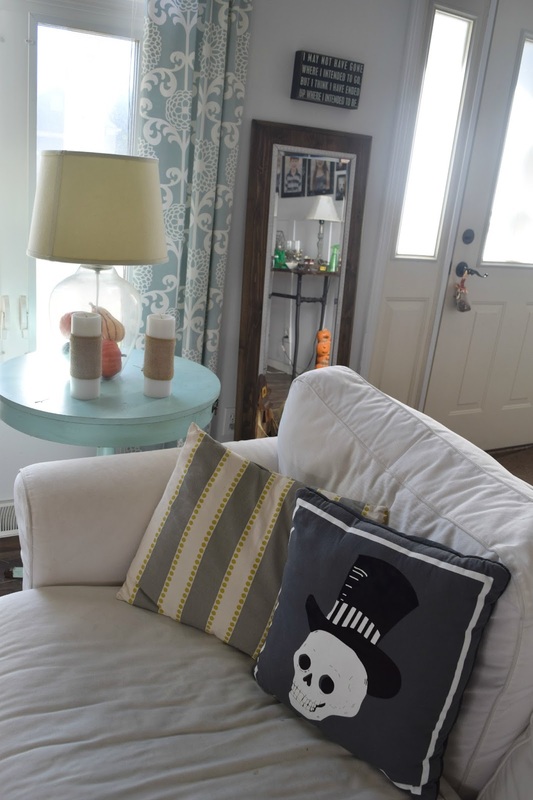 I have a few more pieces of DIY wall art and a big time Halloween themed gallery wall to reveal. That should be rolled out this week in two more parts. It was a DIY overload. Like usual. The leaf garland is another new project, this one glows at night with twinkle lights. I am not sure if it is very spooky. Can twinkle lights be anything but magical and pretty? I figured the leaf garland can stay for the Halloween look. This bat wall art, it was so simple. I even cheated and purchased ready cut and folded bats from a craft store. All I did was stick them on the backside of my string leaf wall art and called it a day. A bat-tastic day ready for Halloween. I love the mix of white and black for Halloween, it feels like a twist on the traditional orange for Halloween. 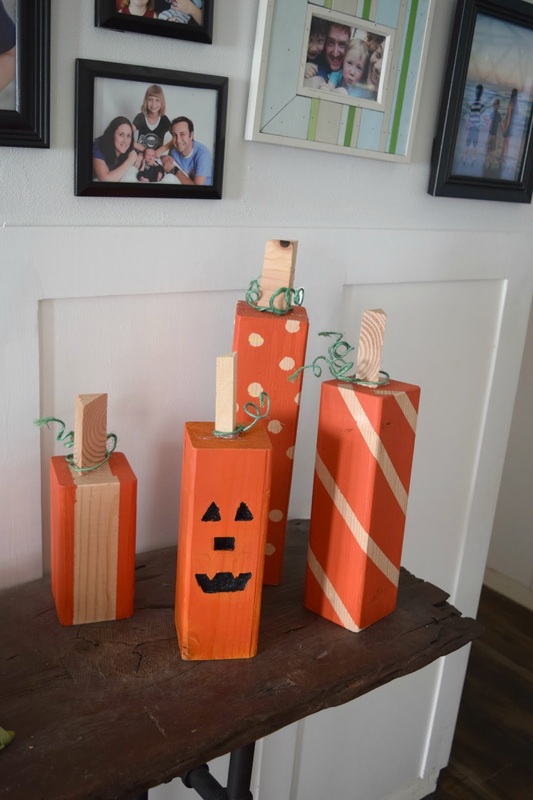 I created these wood block pumpkins and shared them over at Homedit. 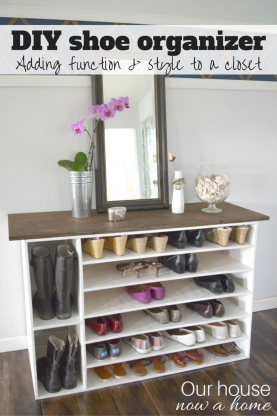 There are a ton of these floating around the interwebs and they were just too adorable to not make for my own home. There is a unique one in this mix that Dale is going to break down himself. He did this project all on his own. I have a handy man who likes to take the reigns and decorate from time to time. This was part of the chalkboard art tutorial. 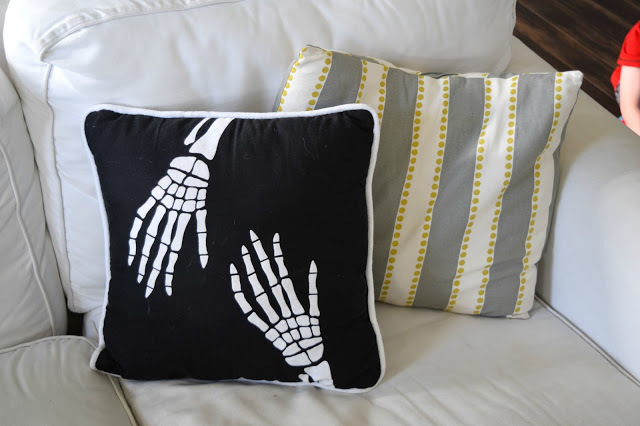 I believe I got these black and white skeleton pillows from Target a few years ago. I pile them onto my fall pillows. A gray, yellow, black and white look going on. It feels right for this season. I had big plans for this front porch, but life happened and I only managed to squeak out a few new things here. It is still ready to greet the trick-or-treaters in our neighborhood and helps my kids get into all things Halloween. Sometimes things are not full blown perfection. I will be sharing the fun spiderweb wall art I created. 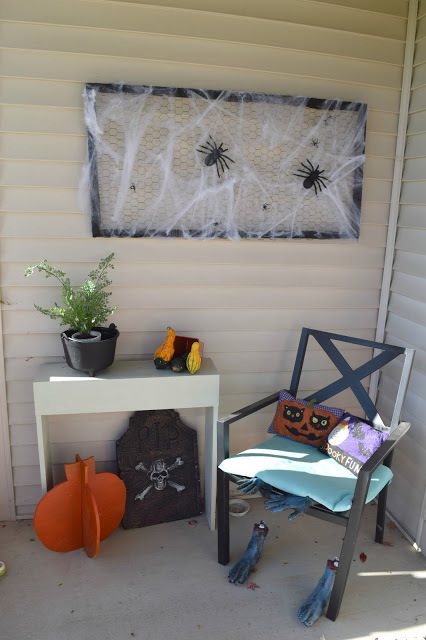 It was super quick and a simple way to add spiders to the front porch. 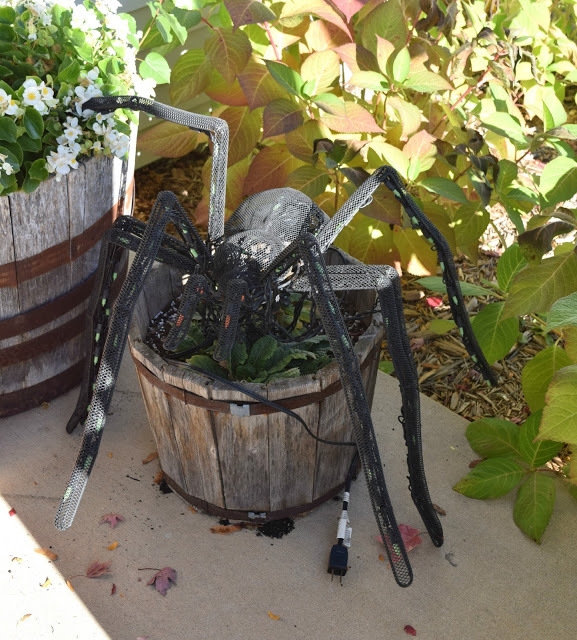 When in doubt while decorating for Halloween, just add spiders and cobwebs. It works every time. Also random creepy fake body parts. Someone was sitting in that chair for a long time, and then the chair ate it? Not sure what is going on with this, but my kids love that creepy chair with feet. Does anyone else feel like the weeks are speeding by? We are almost done with October already! This time of year speeds up for me so much, with back to school, then Caleb’s Birthday, Dale’s Birthday and then all of the Halloween and fall festivities we always do. Mix in the previously mentioned constant change of decor this time of year, I blink and we have 1 week to get Christmas presents under the tree and then we are saying happy new year. I try to take in all of the holidays, otherwise they will speed by without much notice. I think that is why I love decorating for the seasons and holidays. It does get you into that spirit. Whatever it is, makes you take it all in a little more. I know I am a visual person, so having the visual of it being Halloween helps me get there mentally. 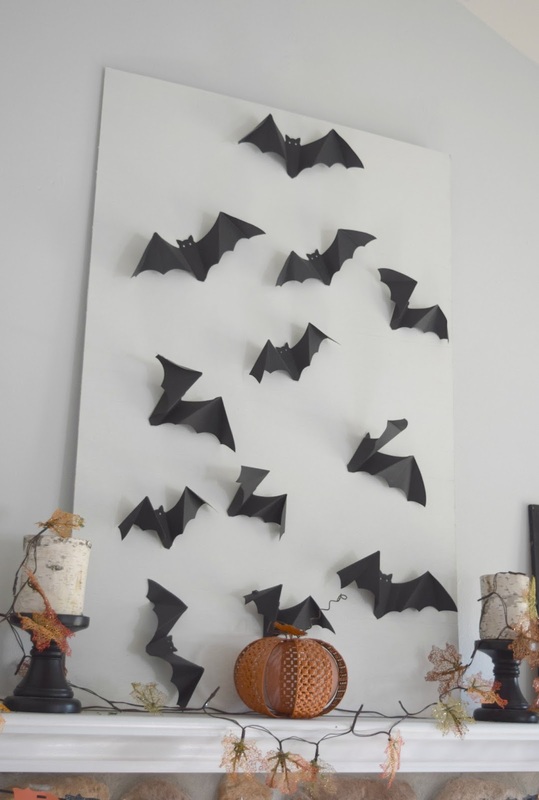 Do you go all out with decorating for Halloween? Everything looks great Emily! 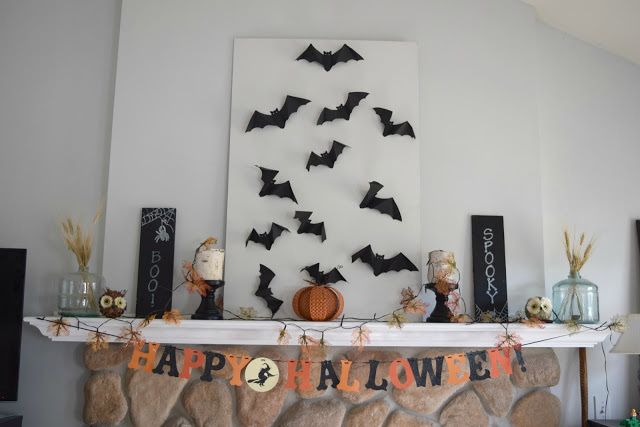 I love the Keep Calm and Scare On sign and the bat art! Well, if that's not the cutest thang ever!!! I am going all out in my front yard this year. Still working on it. Thank you so much, how fun decorating your front porch! You have a beautiful home!! I LOVE Halloween. Your decorations are awesome because they're so classy and chic! I laughed at the "Lazy cleaning" part. One year I was knocking down cobwebs on the porch before a Halloween party I was hosting and I thought, "What am I doing? This is the only time they'd be appropriate!" hahaha! I have tons of awesome Halloween decorations but I never seem to put them up until the last minute because life always gets in the way. I even have a big inflatable Halloween decoration for the front yard. Hahaha! Thank you so much! I agree, this time of year is the time when cobwebs and dust just adds to the ambiance! Yes! I totally feel like the weeks are speeding right by. I don't even have any decorations out yet. We had my son's Star Wars birthday party last weekend, so I was going to do it after that, but now it's almost too late. I love all of your decorations. They are so cute and crafty and tasteful. My kids would go crazy for that outdoor spider! How fun, that would have been a fun birthday party theme! We just had a LEGO themed one and it is lot to mix in birthdays this time of year. The ever changing decor is big right now. I love all your Halloween decor! It's so adorable! I feel like you do though, why can't the holidays be spread out a little more so I can enjoy the decorations for longer? Usually Halloween is here before I realize it so i'm dragging my decorations out just a few days before! LOL. Thank you! I tend to be early with decor just so I can enjoy it. It is hard to stay on top of it though. Cute Halloween decorations! I especially love the bats. My kids have been begging for us to finish putting up our Halloween decor for a while. I think we will do so later today. Thank you so much! 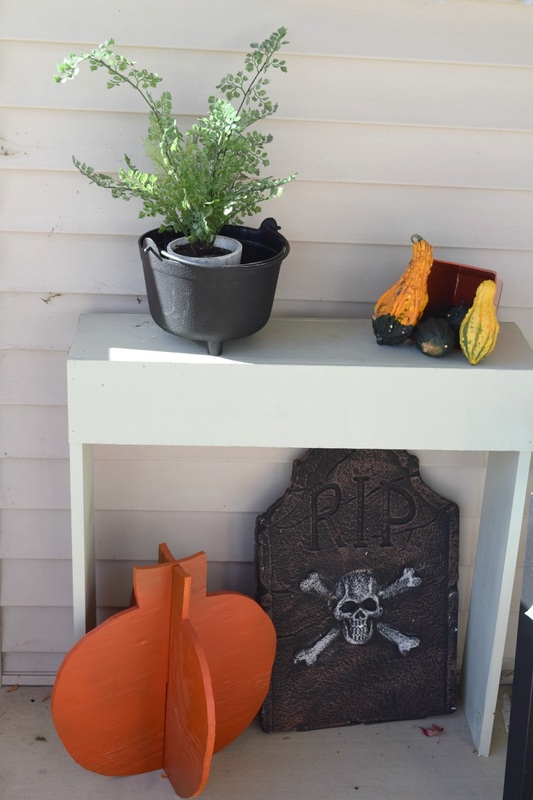 It is fun and kids love Halloween decor especially! Oh wow you have some great decorations!! Want to come do my house? Lol. We always put up decor, but yours is definitely top notch! Thank you so much for the sweet words, I have fun decorating! Love it! 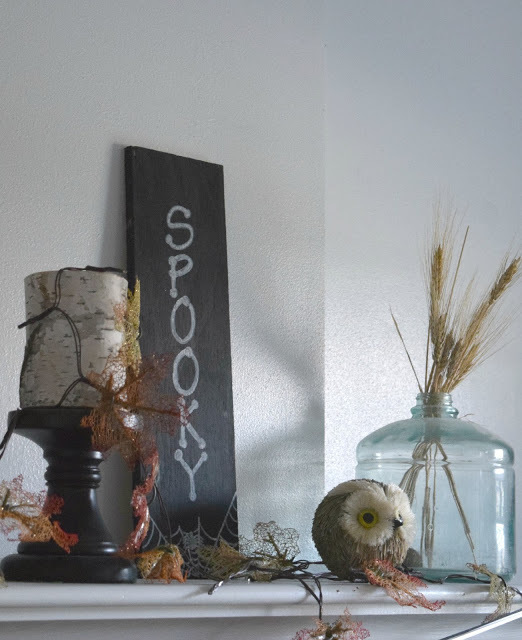 I tend to stick with just fall decor, because as you pointed out, there's a lot of decorating going on in a short amount of time. 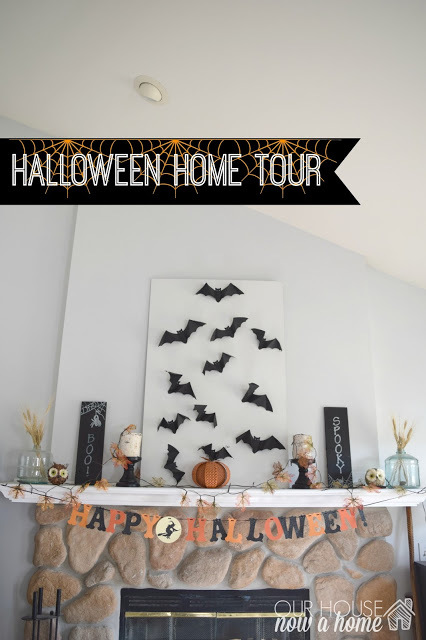 Thanks for sharing your spooky home decor' tour! I love your painted pumpkin wooden blocks!! My fav! Those are all awesome decorations! I love getting the house decorated for the holidays 🙂 My favorites are the giant spider and the 3D bats! Thank you so much! 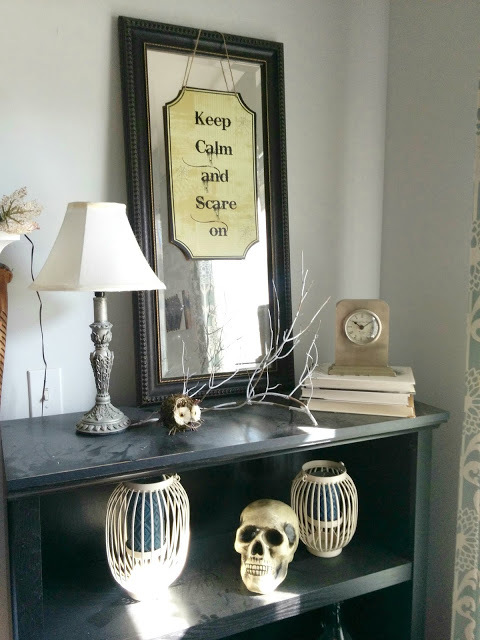 I have had fun decorating and my kids are loving all of the special spooky decor. 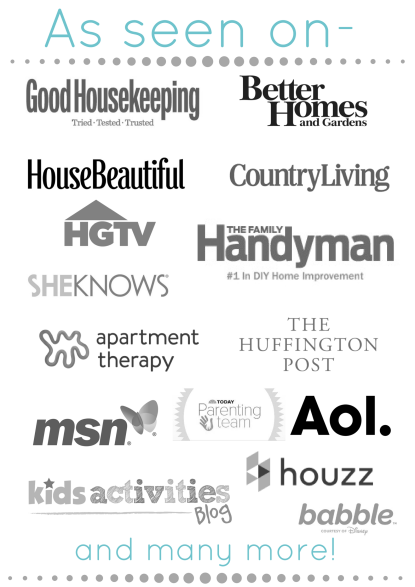 Your home is all ready to go! 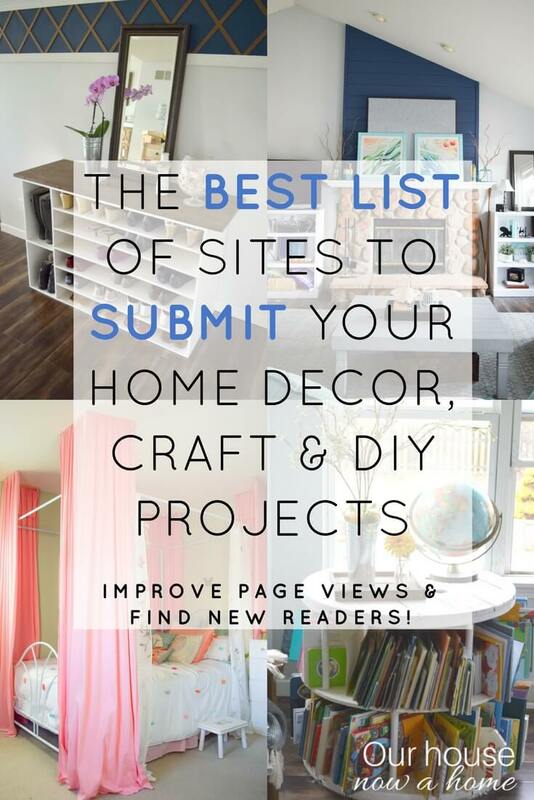 So cute – I love how you decorate!! ohhhhb lovin the bat wall art!!!! Thank you, that was so simple to make. I love the decorations and I'm with you! Too fast. I feel like I barely get one thing out and another one's here. I'm still trying to get my house set up from our move in JAN! And here it is, almost November. 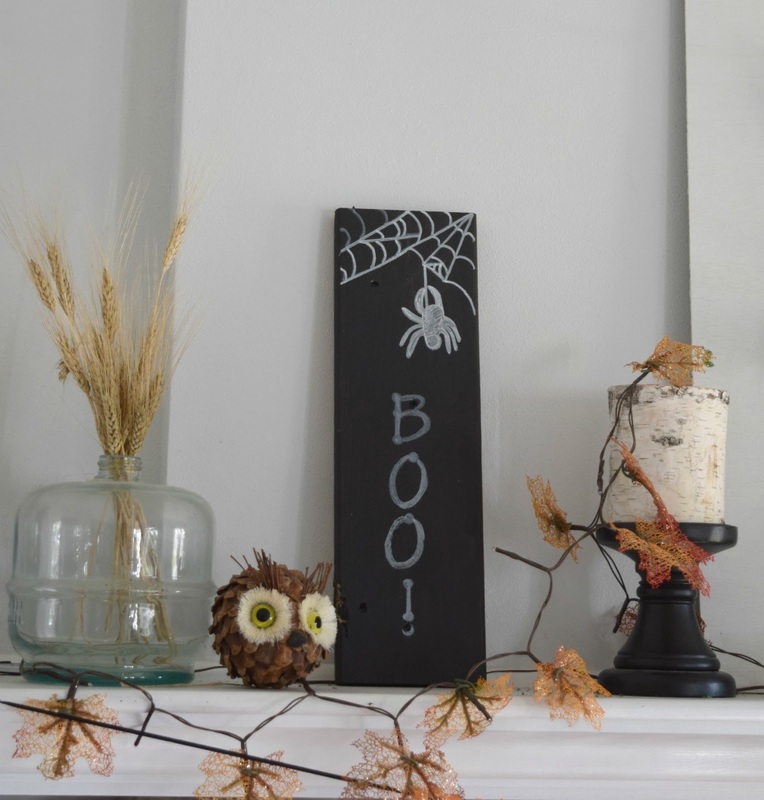 Either way, your house looks spook-tacular! That is so true! Time is always going so fast!